This Dylan Thomas poem was featured on my late friend Ira's "Iraman" blog. It's been just over 2 days since I first learned of my friend's death from heart attack, and the raw sorrow for a great man taken much too early is slowly being replaced with gentle grief for his close friends and family who will be putting his body to rest tomorrow. Ira had so many friends from all over. He was also a devoted family man and always spoke with so much love and pride for his kids and his SO, Nicki. While I am sad for my loss, it pales in comparison to my sadness for those who called a great man father, grandfather, and partner. I first became familiar with Ira via friends' Facebook pages. I always liked his comments and advice. Often we'd have interesting discussions about a variety of topics on friends' walls. Eventually I sent him a friend request and enjoyed being a recipient of his advice and support on my own Facebook status posts. Ira was a gifted photographer and a Mac computer guy, so he'd offer great input re: these arenas. The last piece of advice Ira shared with me was to wait a few weeks to upgrade my OS to the new OS X Lion...to let the early adopters find the bugs, first. Ira was also immensely generous. For every race he participated in he donated $100 to the Livestrong charity. I recently benefitted personally from his generosity, as he donated to my JDRF Ride to Cure campaign. This donation forever cemented Ira on my list of "one of the good guys." Ira was approaching his 65th birthday and had a year of races all over the country planned (half marathons, marathons, half-Ironman, full Ironman)...in large part an excuse to meet far-flung friends. In addition to being a gifted athlete Ira was funny. Very funny with a wry, self-deprecating sense of humor. He ran into a bit of trouble with the Ironman race folks when he adapted their logo for an "Iraman" graphic. That blog entry continues to be one of the funniest things I have ever encountered on the interwebs. So many will miss Ira's presence. A mutual friend and I were struck by the realization that Ira's passing marked the first friend that either of us has lost. We've both lost relatives to old age or battles with terminal disease. But Ira was someone we CHOSE to have in our lives. And the suddenness of his passing as an otherwise strong and healthy person made his loss all the more shocking and difficult to process. Yep, last weekend's race confirmed it, I'm quite smitten with the duathlon! 5 days ago I woke dark and early for my 3rd ever run-bike-run race, the Grand Haven Duathlon (sprint distance, 5k - 20k - 5k. There are also 2 triathlons, sprint and olympic distance). I had a great time, even though I again had embarrassingly slow transitions. Slow enough that if they'd been as fast as the transitions of the 2 other women in my age group AND if I'd pushed to knock even 30 seconds off my time I could have taken first in my AG...hmmm... I'm learning the hard way that transitions are still part of the race. The clock is still running. Transitions can make or break a person's race position. Part of what's slowing me down is messing around with swapping the Garmin from wrist to bike and back to wrist. Even with the quick-release base I'm wasting time changing modes. So I think I'm going to pull my old, flaky Forerunner 305 out of retirement for my next race. I'd wear that for the run portion and leave it on my wrist...having the newer device already set to go for the bike leg. Perhaps someday down the line I will look into a dedicated bike-specific Garmin or even get my hands on a cheap 205 for running (and reserve the 305 specifically for the bike), since I wouldn't need the wireless capabilities. But I also find myself in transition trying to catch my breath and taking too much time leisurely going through the shoe change, helmet, etc. And, the biggest dumbass move from this race, untieing shoes that I had double-knotted in my sleepy morning haze...that was really a boneheaded move! I may get my hands on a pair of Yankz laces before my next race. That should help cut some time on the running shoe changes. My run splits for this race were really bad...slower than some of my training runs. But at race start it was already pushing 80º and humid. So far I am batting 3/3 on steamy races in Grand Haven. I really held back on the first leg, as I am so prone to heat sickness and cramping (my Scandinavian and Scottish blood doesn't lend to heat tolerance--especially since we've had so little heat to acclimate to, this Summer). The bike leg was fabulous. I was first in my age group on the bike leg by almost 2mph pace (23/46 on the bike for the entire duathlon race field...and this is including super-speedy people on dedicated time trial bikes with wheels that cost more than my entire bike). As crummy as my runs were, I actually moved up quite a few places in the field of 46 for the 2nd run (from 41 to 32), even though my pace was slower. The heat was really getting to people and it's pretty obvious that some of the field blew-up. Perhaps some folks don't embrace the brick workout, either. I loves me some brick workouts. The more I do them, the better that transition from bike to 2nd run feels. Leaden quads are not conducive to running. My bike split was 1.3mph pace faster than my bike split from my previous duathlon--granted that was a rough race, early in the season after an endless Winter that cut into my training, brutal headwind for about a third of the course, and with foot and calf cramping issues from shoes that were too narrow. 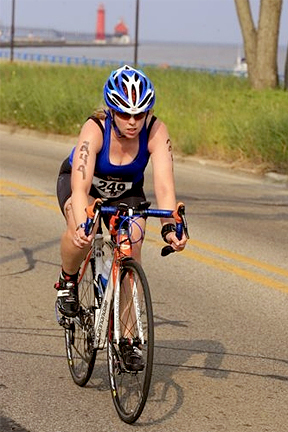 I'm really looking forward to my next duathlon, on Labor Day. That one is a 2.5k - 22k - 5k. I like that it's relatively bike-heavy. Though I'd love to see the Grand Haven race offer a 10k - 40k - 10k duathlon option. They could easily do this, since they have the Olympic distance run and bike courses already laid-out. They could almost bill it as a Powerman duathlon (though the bike leg would be about 20k to short to really do that), which would be a really excellent goal...though maybe not in the middle of July. The folks coming in from the Olympic distance tri were in pretty rough shape by the end when the temps were well into the 80s. Before the next race I REALLY want to drop at least 5#s. I've totally slacked on my weight loss efforts. And the few pounds I lost this Spring have returned. Last Summer I lost weight without even trying, but I think this was in large part due to throwing a new sport at my body. Now that my system is accustomed to the rigors of cycling the pounds are going nowhere fast. Just losing a few pounds will make me faster for the run legs and faster on the uphills with the bike. I really don't want to be last in my age group, next time. And I'd like to have a whole bunch of race photos that are order-worthy. Right now the majority of them are pretty humiliating. Fat looks especially bad when photographically captured in-motion during a race. There is a very real risk that you will become so accustomed to only applying sunblock down to your sockline. This is all well and good if/when you are actually wearing socks. Kinda not so good when you are at the beach. My beach bumming day was utterly lovely, though, aside from the random spots where I missed sunblock. We (the rugrat and I) sat under perfectly blue skies for about 3 hours with a friend and her kids. Really a perfect day. Perfect temps (in the low 80s), low humidity, gentle breeze, good company (we ran into a few other friends on the shore with their kids). Pure Michigan (love that ad campaign). I have my 2nd sprint duathlon of the year in 2 days, so today was a rest day...and rest I did! Rest + 2 bottles of New Glarus' finest (1 Spotted Cow and 1 Moon Man) accompanied me to the beach. I have high hopes for this race. My training for my last race was overly aggressive, but my taper was inadequate. I arrived at the starting line still feeling pretty beat. Instead of feeling jumpy with pent-up energy I felt heavy and sluggish. I PRd my first 5k leg by a mere 1 second and the cycling leg (that wasn't any surprise...new, lighter, more aggressive bike and a full year more cycling experience)...but died by the last running leg. This time around I am going to do my best to go out a hair slower for that first run leg...treat it a more of a tempo warm-up. I'd prefer to have even or negative run splits, this time around. I still plan to go gangbusters on the bike leg, though. That's my strong suit (not that this is saying much...it's all relative). The only bummer is that I will be missing out on a BIG JDRF training ride starting late morning. My race is at 7:45. I expect to be done by 9:30 or so, but I'm assuming that I won't be able to get my bike out of transition until all of the olympic distance triathlon competitors are done...so that could take a while. I doubt I'd be able to leave earlier than 10:30 and the training ride is an hour away. It's OK. I won't likely want to abuse my legs more after the race, anyhow. If I do it right I won't be able to drag more out of them. In bittersweet news...I finally sold my original Oby bike (so now I have 2 bikes, Oby 2, the road machine, and Little Rock, the cyclocross beastie). The bike that got me hooked. But I'm glad that my first velo-baby went to a friend in Oregon. If any bike can get a person feeling the bike love, it's that pretty machine. I took $750 from the sale of that bike and dumped it right into my JDRF Ride to Cure Diabetes fundraising account. That put me just beyond the halfway mark toward my $4000 fundraising goal. Right now I'm at about a dollar/mile pedaled in 2011, which is kind of a funny coincidence. I still have a long way to go, though, and we're now <100 days away from the big ride.